Get ready to start your Indiana course! Same as the online course, but the course is mailed to you on DVD. Choose this course if you are under the age of 18 and getting your driver license for the first time. Official State Approved Course - Satisfies requirements of the BMV notice and/or court. Also reduces points on your IN Driving record. Access your Indiana Defensive Driving course anywhere, anytime, and from any device. Created by the famed Improv Comedy Club, our Improv Defensive Driving Course provides a convenient and cost-effective way to complete your defensive driving class online. Based on a simple notion that a defensive driving course doesn’t have to be dry and boring, our Indiana Defensive Driver Course has undergone numerous studies and have proven effective in reducing future tickets and accidents. Improv Traffic School is proud to be licensed by the State of California to offer you a certified IN Online Defensive Driving Course. View our certification. *State fees may apply. We report your completion to the IN BMV and provide a FREE DOWNLOADABLE PROOF OF COMPLETION which you can print from your account within 30 minutes - YOU ARE DONE! Improv Comedy Traffic School was created with a single mission in mind, to offer you a fun and simple alternative to those boring traffic schools. Since then, we have helped over 3 million students and we would now love to help you! From students who took our Defensive Driving Courses in Indiana. This Indiana Defensive Driving Course is the best comedy defensive driving course around. I am very impressed by the quality of your program. Great defensive driving course for Indiana drivers. If you have been convicted of a traffic offense, want to reduce points on your driving record, have been ordered by the BMV/Court, or are looking to lower your car insurance premium, then an Indiana Driver Safety Program may be just what you need. 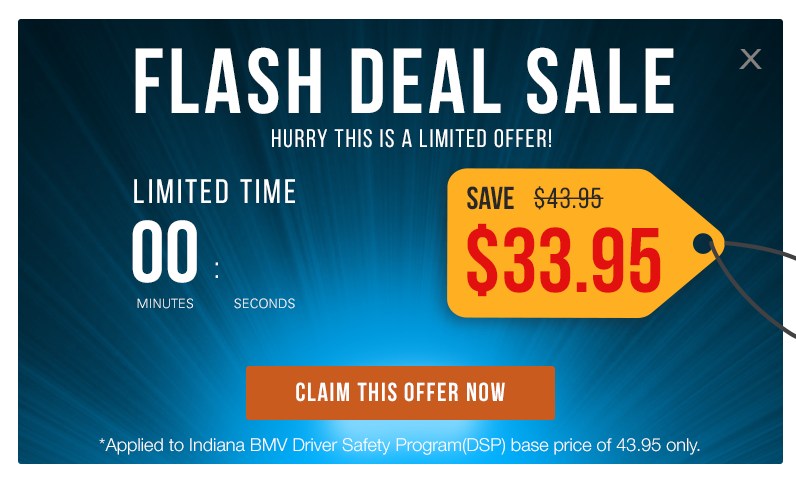 Sometimes called traffic school classes or a defensive driving course, Indiana Driver Safety Program courses ordered by the BMV or taken voluntarily to reduce points on your driving record, must be approved by the IN BMV. For whatever reason you choose to complete an Indiana BMV-Approved Driver Safety Program, you'll additionally gain the knowledge needed to avoid traffic violations and car accidents later in life. In this article you will discover the information regarding situations that can benefit from the completion of an Indiana BMV-Approved Driver Safety Program/Traffic School, and you will learn about what options you have for completion. You have 2 options for completing an Indiana Driver Safety Program: (1) Take the course online, or (2) take it at home by watching a DVD or video. It comes down to a matter of personal preference, but we recommend taking the course online. NOTE: If you are taking the Driver Safety Program for point reduction purposes, whether voluntary or ordered by the BMV, you must take a BMV-Approved Driver Safety Program. You have come to the right place! BMV ordered requirements, you must complete the Driver Safety Program within 90 days or your license will be suspended. NOTE: By completing a BMV-Approved Driver Safety program which is ordered by the BMV, you will not only satisfy BMV requirements, but will also receive a 4-point credit to your driving record as long as you haven't completed a Driver Safety Program in the past 3 years for point reduction purposes. You may decide on your own to take an Indiana Driver Safety Program on defensive driving every 3 years to have 4 points taken off of your license. It may take 7 to 10 business days for the BMV to recognize that you have completed the course and to remove the points from your driving record. If you want to lower your risk of having your license suspended, consider completing the course before reaching the point when the BMV will require you to take the course. For example, if you get one traffic citation and you haven't taken a DSP course within 3 years for point reduction, you should consider taking the course. That way, not only will you have fewer points on your record, but if you were to get a second traffic citation within 12 months, the BMV will not order you to take the course because you have already done so voluntarily. You may just choose to complete a defensive driving course to earn the safe driver discount, courtesy of your auto insurance provider. Be sure to consult your provider for more details and to see if you are qualified. If you come to find out you are not qualified for a car insurance discount, you may consider shopping around for a new provider if your premiums are too high. Upon completion, you will receive a certificate of completion and your completion will be automatically submitted to the BMV.